Miami’s commercial real estate market offers a wide range of projects and property types due to its access as an Atlantic coastal town. Miami has distinct cultural influence as a transportation node between North, Central, and South America. It also possesses economic diversity with many opportunities illustrated by a variety of business sectors within the 305. Miami also serves as one of the leading contributors to Florida’s commercial real estate market, which shows consistent, positive signs through a wide range of fiscal measurements: economic growth, unemployment rates, vacancy rates, and foreign investments (to name a few). Many of the aforementioned statistics are directly impacted by The Magic City. 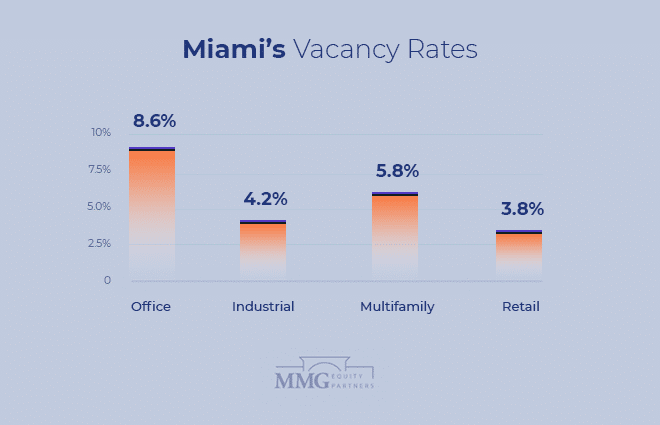 We broke down the highlights of Miami’s commercial real estate market with metrics that focus on 4 primary sectors: office, industrial, multifamily, and retail. Not unlike a majority of cities across the United States and the entire world, the unemployment rate peaked after the subprime market crash in Miami to 13% in 2009. However, economic recovery during the past few years drastically changed the employment situation for the better. Since 2009 the unemployment rate in Miami dropped nearly 10% to 3.5%. This is an excellent barometer for the economy, not just because more people are employed, but it demonstrates that companies are doing better overall. They have the cash flow to hire for respective vocations within their organizations. Of course, those employed citizens can then contribute more to the economy by spending and contributing to the fiscal flow. Fortunately, the employment situation continues its positive trend as more and more people start to call Miami home. One of the most impactful reasons for the previously stated stats is continued population growth. Florida alone is ranked 4th in the nation for population growth from 2010 till 2017 at 11.6%. 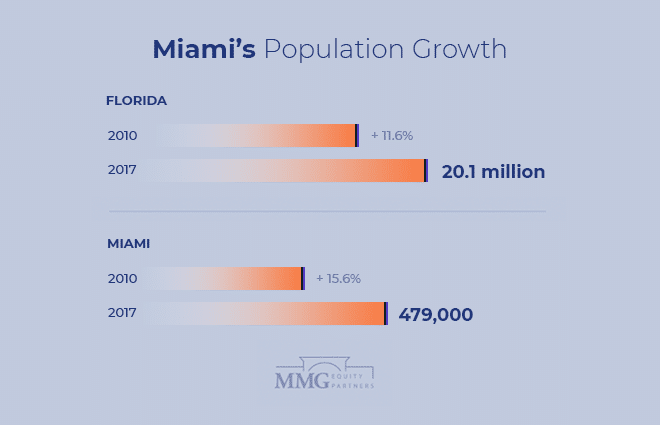 Meanwhile, Miami is currently 40th among all cities nationwide in terms of population growth from 2016 to 2018 with an increase of 2.7% (currently 479K residents). Since 2010, Miami’s population grew 15.6%, with a minimum growth of 1.2% and a maximum of 3.25% year-over-year. This consistent, tangible increase of residents in Miami is a primary engine for all of the economic surpluses going on in the area, especially in the CRE market. 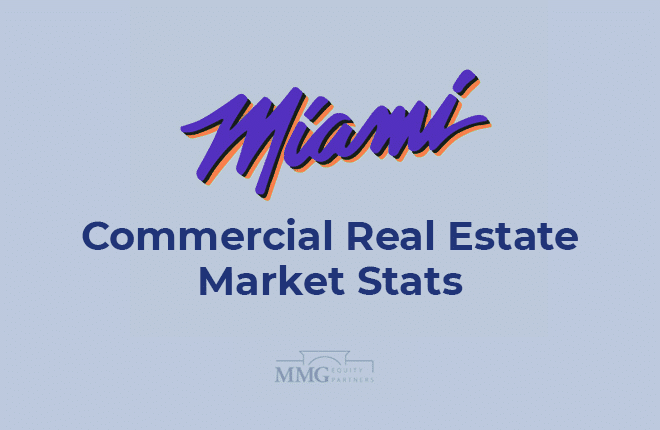 This progressive impact is witnessed with the illustrated stats above, and since the population is projected to continue its growth, the commercial real estate market in Miami will continue to produce favorable statistics. Figures and stats collected from CoStar, Colliers, Avison Young, TheRealDeal and BizJournals reports. The numbers on this page are for Miami specifically.